Description: Discovering God as Your Friend and Not Your Enemy. Your thoughts and words confirm God's work in your life, or they can unknowingly provide aid and comfort to the enemy. 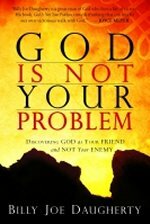 Billy Joe Daugherty, pastor and teacher, provides powerful proof that God Is Not Your Problem---He is The Answer. * Christ's victory and Satan's defeat. * Your true and tangible inheritance. * How to walk in God's Word. * That God's gift of abundant life has always been and really is within your reach. Dr. Daugherty takes a fresh, new look at Paul's thorn and Job's challenges. He is shockingly honest about how believers choose to ignore God's love and instead accept Satan's pitiful ploys. If you have faced personal difficulty or tragedy and then questioned His will, this book will identify and magnify the mercy and grace of your loving Father and sovereign God. The principles provided will set you free to believe He has only the best in store for you---today and forever.